Join Crystal Cruises on their 25th annual world cruise aboard the Crystal Serenity! Embark on an epic adventure through the Southern Hemisphere and beyond, exploring fascinating lands that will captivate your curiosity, tantalize your senses, and warm your soul with sun-drenched wonders. 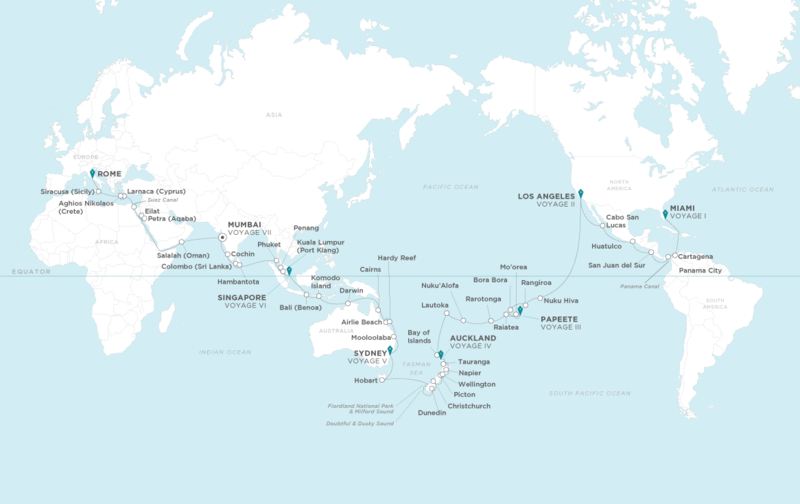 On a journey of discovery throughout the Pacific and Indian oceans, and into the Tasman, Andaman and Mediterranean seas, uncover the marvels of man and treasures of Mother Nature, from the Panama Canal to the Great Barrier Reef. Relish the welcoming joie de vivre of idyllic French Polynesian isles. Allow the majestic fjords of New Zealand to stir your inner adventurer. Go walkabout the Australian Outback and delve into the UNESCO World Heritage sites of Sri Lanka. Dip your toes into the cultural melting pot of India, and follow the path of legendary empires in Arabia. This 105-day odyssey weaves a vibrantly colored tapestry of traditions, flavors and enrichment that will leave you speechless as each destination unveils its own story. Cruise & Travel Experts Exclusive Amenities coming soon! Book soon to take advantage of full world cruise benefits! * All fares and savings are per person, in U.S. dollars based on double occupancy. Brochure Fares and Book Now Fares are cruise only and do not include taxes, fees, and port charges of $5,720 per person. Book Now Savings are subject to availability at time of booking. Book Now Fare includes Crystal Savings and does not include Crystal Society or Early Full Payment savings. Early Full Payment saving is based on the fare after all other discounts are applied. Optional Personal Select Air Program is available to purchase for full-fare, full-cruise guests whose travel originates from a U.S. or Canadian airport and includes all government taxes and fees. Note: Early Full Payment savings do not apply to Personal select Air. Solo Traveler fares are available upon request. Crystal Society Savings are per person based on double occupancy. All offers may not be combinable with other promotions, apply to first two full-fare guests in stateroom or suite, are capacity controlled, subject to availability and maybe withdrawn or changed at any time without notice. For complete Cruise Fare and Promotional Information and General Ticket Terms and Conditions, click here. Crystal Cruises, LLC reserves to the right to correct errors or omissions and change any and all fares, fees, promotions and programs at any time without notice.